The Baen Free Library is a digital library of the science fiction and fantasy publishing house Baen Books where (as of December 2008) 112 full books can be downloaded free in a number of formats, without copy protection. It was founded in autumn 1999 by science fiction writer Eric Flint and publisher Jim Baen to determine whether the availability of books free of charge on the Internet encourages or discourages the sale of their paper books. The Baen Free Library represents an interesting experiment in the field of intellectual property and copyright. It appears that sales of both the books made available free and other books by the same author, even from a different publisher, increase when the electronic version is made available free of charge. 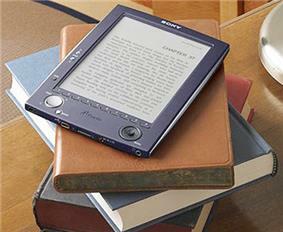 In 2002, Baen also started adding CD-ROMs into some hardcovers of newest titles in successful series. They contain the complete series of novels preceding the printed book (for those books that were the latest in a series), other works by the same author, some works by other authors, and multimedia bonuses. The CD-ROMs have a prominent permissive copyright license which expressly encourages free-of-charge copying and sharing, including over the Internet. The books in the Free Library are available via the website for Baen Ebooks, which also sells individual e-books and a subscription-based e-book program. This section lists letters from readers to Baen's "First Librarian", Eric Flint, and responses he made in return about the Free Library and its offerings, but more importantly these discuss the experiences of Baen with offering free titles and further discuss issues in ePublishing in general. Of particular note, are the grateful letters from blind and handicapped individuals, and the wide geographic demographic of the Baen experiment. However, most of the material is historically interesting 'snapshots' of the arguments over intellectual property rights in the early days of the Free Library and development of the Baen Books publishing style of offering titles both by download and in print. 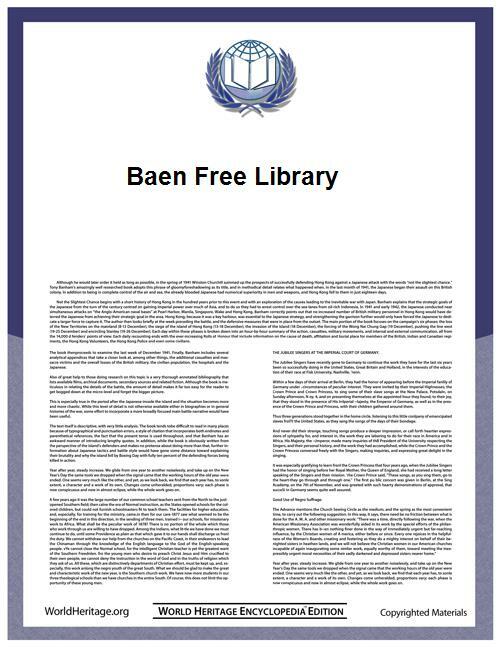 *Introducing the Baen Free Library Eight pages on how the library came to be and the software piracy and publisher issues in general. *Letters to the Librarian December 20th, 2000 A selection of 123 letters about the free library as seen by the readers; of particular note: Messages from a blind reader and a handicapped reader. *Letters to the Librarian January 16th, 2001 Special Report on 200 plus Letters received in 24 hours when the Free Library made internet news. Letters to the Librarian February 04th, 2001 Special Report on self-publishing on the internet with commentary by First Librarian Eric Flint. M.P. Macaulay on copyright law 1841 issues Two speeches on copyright law to the British House of Commons during 1841, characterized by historian Flint as brilliant, as they cover the issues still problematic in copyright law. Letters to the Librarian, Eric Flint April 15, 2002 One and a half years into the Library, Flint provides hard numbers on how sales and works listed on the Baen Free Library are related. Letters to the Librarian, Eric Flint April 26, 2002 More numbers on how hypothetical thefts can't be harming publishing industry to any significant extent. Discusses as well Book Vs eBook preferences, and need for authors to achieve exposure and the role of the Free Library in providing such. Letters to the Librarian#1, Eric Flint May 12, 2002 Stance on helping blind and handicapped persons and others of limited means including kids obtain free materials with an argument of how that eventually helps an authors sales. Letters to the Librarian#2, Eric Flint May 12, 2002 Discusses paper versus screen reading; studies showing much better retention from paper learning, and includes a long letter relating experiences on sales by an educational publisher once they offered free works like Baen Free Library. ^ "Prime Palaver #6". Baen.com. 2002-04-15. Archived from the original on 2 January 2010. Retrieved 2010-01-28.